A Guide to Runners Foot Care. Taking care of your feet is essential to a healthy lifestyle, and in no sport is it more important than for runners. 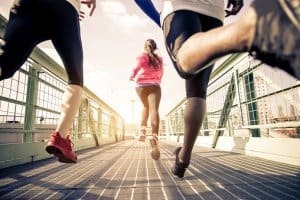 Whether you are training to run a marathon or just trying to stay fit, there are several ways you can keep your feet healthy for your next run. Wearing the proper footwear is crucial no matter the level of activity. Whether it be participating in a 5 K or running the Pittsburgh Marathon, finding a shoe store that specializes in running shoes is a good start to you fitness journey. Sales representatives at these stores are very knowledgeable of their products and can find a shoe that meets your stride and foot striking pattern. It may seem obvious that if you run you should take care of your feet, but this is an aspect of the sport that several runners overlook or make a priority. Some forget, others simply do not know how to take care of their feet. Runners should file down any callouses and cut their toenails straight across. Doing this after soaking your feet or after a shower will make this a bit easier. Wear synthetic socks. Cotton is rotten as they like to say in the sport. Cotton socks absorb moisture and create an environment for blisters to form. Many runners injure their ankles or feet by overuse, or running too much. Training can at times prevent injuries, to much running can lead to other problems such as inflammation of the feet, stress fractures, or plantar fasciitis. The best way to avoid this is to slowly build your mileage over time. Increase the distance in small intervals each week. If you suspect that you have an injury, take some time off to ensure that pain and symptoms subside. Some people feel that they need to power through, but that will often lead to more serious injuries like those mentioned above. If icing and rest do not help your pain or symptoms please come and see a podiatrist. A podiatrist can identify the cause of the pain and recommend treatments that will get you back out running as soon as possible. If you are experiencing foot pain or injury, make an appointment today to have your problem addressed and get on the path to healing as soon as possible.